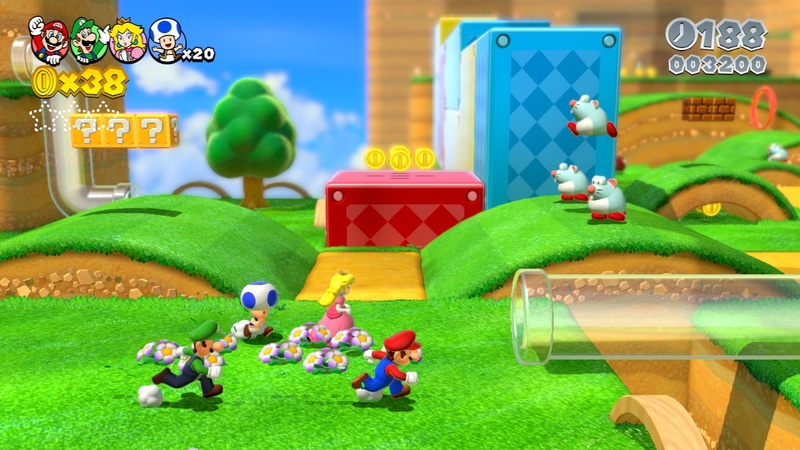 E3 2013: Nintendo focuses on games with new "Mario"
It's all about the games for Nintendo. Instead of a typical flashy presentation at the Electronic Entertainment Expo, the Japanese gaming giant opted to showcase several games for its Wii U system during a brief Tuesday presentation at its booth on the show floor of the gaming industry's annual trade show. "Today is different," Nintendo of America President Reggie Fils-Aime told those gathered inside the behemoth white structure. "It's the reason you're gathered here inside of our booth - standing instead of sitting - because it was our decision to minimize the time from when we said `good morning' and you getting to play the game." Nintendo showed off the cartoony strategy game "Pikmin 3," anti-gravity racer "Mario Kart 8," 2-D platformer "Donkey Kong Country Returns: Tropical Freeze," 3-D platformer "Super Mario 3D World," slick action sequel "Bayonetta 2" and a speedier rendition of "The Legend of Zelda: The Wind Waker" for the Wii U. For gamers who couldn't make it to E3, the titles will be on display at more than 100 Best Buy Co. stores in North America this week. The company also flaunted - but didn't allow attendees to play - a new installment in the fighting series "Super Smash Bros." The new edition will feature such characters as Mario, Mega Man and the female yoga trainer from Wii Fit. The company has struggled since November with the launch of the Wii U, which features an innovative tablet-like controller yet graphics on par with Microsoft's Xbox 360 and Sony's PlayStation 3. Nintendo Co. said it sold just 3.45 million units by the end of March, well below the company's expectations. "We feel very good about this E3, and that's because consumers buy hardware to play games, and we're got a fantastic lineup of games that we're showcasing," Fils-Aime said after the event. During showy Monday presentations, competitors Microsoft and Sony hyped their respective next-generation consoles. Microsoft Corp. touted new games for the Xbox One, which it said will cost $499, while Sony Corp. unveiled its boxy $399 console, the PlayStation 4. Both consoles feature richer graphics and deeper social networking capabilities. "Our competition is going to do what best serves their needs," said Fils-Aime. "We're a different type of company, utilizing our first-party titles to drive our install base. We've done that very effectively for over 30 years. We're a video game company. We make great games. That's what we focus on."